If you are in that group of 70% of Americans that spend most of their waking lives either sitting behind a steering wheel or behind a computer screen and wonder why you are in pain, you need to read on. Studies have shown that constant sitting is dangerous to your health. Learn the importance of proper sitting posture to avoid and eliminate pain. Take frequent, small breaks during your work day to release tension. Proper sitting posture can not only help you avoid creating pain, but can also help you eliminate pain. The top line of the computer monitor is at eye level. Computer monitor is 18-20 inches from your eyes. Shoulders are relaxed with head balanced evenly over the shoulder girdle (center of ear lines up with the center line of the shoulder joint). Computer keyboard is at elbow height. Adjust the tilt of your keyboard based on your sitting position. If you sit in a forward or upright position, try tilting your keyboard away from you but if you are slightly reclined, then a slight forward tilt will help to maintain a straight wrist position. Position your arms in at your sides. Support the weight of your arms on a wrist rest (arm rests on a chair can be used if elbows are close to your body). 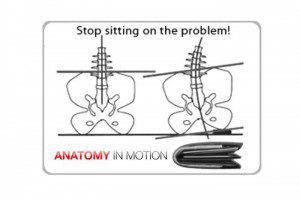 Your chair should support the curve in your lumbar spine. The edge of your seat should not press into the back of your knees. Your feet should rest flat on the floor or a foot stool (hips, knees and ankles at 90 degrees). Over time, poor posture causes the discs between the vertebrae to wear down and loose their ability to cushion and act as shock absorbers. Studies of lumbar intradiscal pressure in standing and upright sitting reported higher pressures in sitting. Sitting for long periods of time can definitely cause or worsen an already existing back problem. Sitting is a static posture that increases the stress on the entire back, shoulders, arms and legs, but especially the spine. Slouching over stretches the spinal ligaments and supporting structures of the spine and nerves. Blood flow is interrupted causing more pain and inflammation. Try to limit your time sitting. Set your watch and get up and move every 30-45 minutes. Introduce gentle postural awareness exercises during the day. Last but definitely not least, get regular Myofascial Release treatments from qualified therapists. The therapists at Verde Valley Myofascial Release are experts in Myofascial Release which has shown to be one of the best techniques for restoring proper muscle and joint alignment and eliminating pain.